This month's protest supporting a Eurovision boycott at RTÉ. 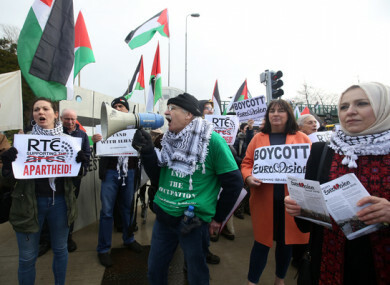 PROTESTERS CALLING FOR a boycott of this year’s Israel-hosted Eurovision have a record of trying to “hijack” cultural and sporting events for political reasons, Israel’s ambassador to Ireland has said. In an interview with TheJournal.ie, Ambassador Ophir Kariv said he was glad RTÉ had been “strong in its position that this is a big cultural event and that politics should not be involved in it”. Email “Israeli ambassador praises RTÉ's 'strong position' on Eurovision boycott calls ”. Feedback on “Israeli ambassador praises RTÉ's 'strong position' on Eurovision boycott calls ”.